A Close-up on Violence. Talk on the concept of ‘implicit violence’ – that is, violence that involves all of us, none excluded, in our daily life. Part of LRSN, LaRadioSiamoNoi: Extended Nervous Systems and White Rabbits by HEAD, Haute école d’art de et design Genève (Geneva University of art and design), Switzerland. 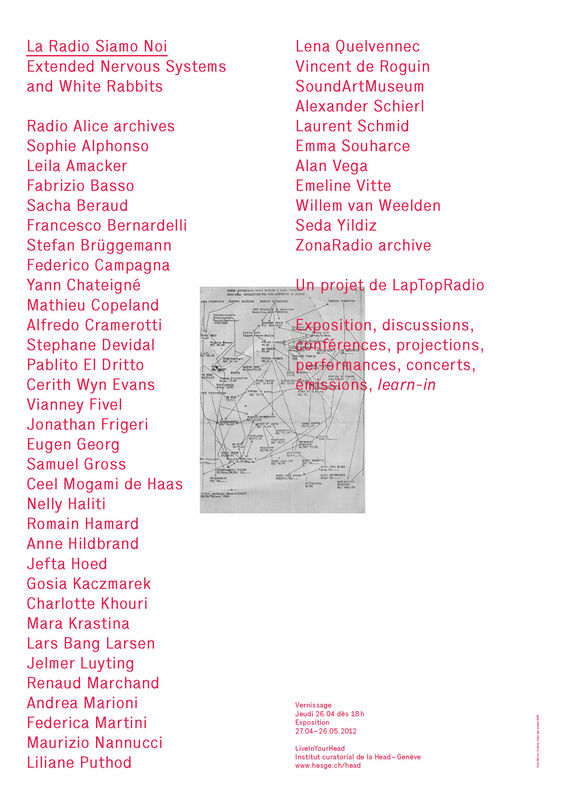 LaRadioSiamoNoi is a collaborative project with different tightly interconnected forums and laboratories forming a common platform, pointing out different aspects of the Italian free radios in the 1970s, their impact and aftermath. We want to rewind the evolution of the initiatives of that period, put them in relation to to each other and to parallel developments and also present actual projects referring explicitly to them.